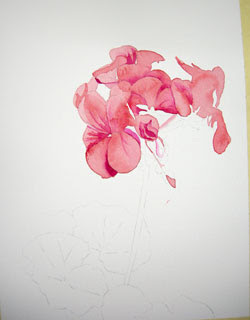 This is the second installment of How to Paint a Red Geranium. At this stage of the painting I have used a cool red, Alizarin Crimson, to paint some cool shadow areas in the flower petals. The value (lightness or darkness) of the shadow areas is important. If it is too light the painting will look pale and washed-out. If the value is too dark, too soon, subsequent glazes will just look dull instead of transparent. I have also used a very wet, thinned wash of Scarlet Lake to brighten and enhance some of the warmer petals. I don't plan to do a background wash for this painting, so I am leaving it alone and concentrating on the flower and leaves. It's important to use a variety of edges, both crisp and soft. Check back for the next installment, hopefully tomorrow!